Service Pack 1 has just been released announced (ish). Hurray! But wait. Whose happiness does it justify? Windows users’? Probably not, based on the following set of reports. We recently covered the many problems in Windows Home Server in order to show the superiority of GNU/Linux-based solutions. It explains Microsoft’s great fear of what it secretly considers and also openly confesses is its most considerable threat. In the same vein, let us take a quick look at Vista SP1 stories. Find out why Microsoft is so focused on the ability to ‘tax’ tomorrow’s platform by passing software patent laws and intimidating companies, thereby establishing protection rackets. PC World’s in-house tests with the release-to-manufacturing (RTM) version of Vista SP1 have shown mixed results. In file copying tests, the service pack proved noticeably faster than the original Vista OS. Other tests, on the other hand, showed little improvement (or actually performed worse than Vista without the service pack). For instance, our preliminary file compression tests showed a decrease in performance with SP1 installed. After extensive testing of both RTM and SP1-patched versions of Windows Vista, it seems clear that the hoped-for performance fixes that Microsoft has been hinting at never materialized. Vista + SP1 is no faster than Vista from the RTM image. Bottom Line: If you’ve been disappointed with the performance of Windows Vista to date, get used to it. SP1 is simply not the panacea that many predicted. In the end, it’s Vista’s architecture – not a lack of tuning or bug fixes – that makes it perform so poorly on systems that were “barn-burners” under Windows XP. This fairly early and heavily-cited study suffered something which resembled smears from Microsoft at the time. The subsequent study from PCWorld concurred with it though. Third-party software companies will have mixed reactions to SP1. While it will open up access to the built-in search functionality for third-party desktop search apps, it has already raised problems for some third-party security software vendors whose utilities have been disrupted by the update. Microsoft has confirmed that some third party applications are either blocked or lose functionality on machines that have Vista service pack 1 installed, including products from Trend Micro, Zonelabs, BitDefender, and Novell. Microsoft Corp. last week slammed the door on a free utility out of Australia that outflanked one of the company’s touted security features in Windows Vista, by having the program’s digital certificate revoked…. Microsoft has published a list of programs that may “experience a loss of functionality”, if they run at all, once Service Pack 1 has been installed on Windows Vista. Vista SP1 will include a significant number of “proactive” security changes, DeVaan said. These do not represent fixes for specific vulnerabilities, instead they represent Microsoft’s efforts to head off potential threats. There are several more examples, but the 4 reports above ought to suffice. As far as the Vista user experience is concerned, users shouldn’t expect any significant changes with SP1. Although Microsoft has reported solid sales of Vista, a lot of copies went to corporations that tried the program for a few weeks, then downgraded to XP. My install of the SP1 RC Refesh has gone wrong. And then reboots, and reboots, and reboots … I had it rebooting for over an hour before I stopped the madness. All the safe modes does the same, so how do I uninstall the installer, without being able to log in? Perhaps as a result of the bad experiences above, Microsoft was very silent, ambivalent and by no means forthcoming about the availability of a finalised Service Pack. Here are some articles of interest. Microsoft has admitted that service pack one (SP1) for its Ultimate edition of Windows Vista will not be made available to everyone in mid-March as originally planned, because of a delay with 31 of its language packs. Continuing their apparent efforts to take the steam out of Windows Vista, Microsoft today announced that the long awaited Windows Vista Service Pack 1 is being released, but not to Vista users. That’s right, SP1 is now RTM (Released to Manufacturing), but won’t be released via any means to end users or even system administrators for at least another month and a half. Windows Vista (RTM) received its fair share of negative reviews, but hereby we wish to present only evidence that the “Service-Pack-will-fix-everything” promise (or vapourware) is nothing but a delaying tactic that results in further disappointed. Expect the same with SP2. Around the same that Service Pack 1 was finalised, its marketing chief left quite abruptly. This caught Mary Jo Foley’s eyesight. Michael Sievert, Corporate Vice President for Windows Product Marketing, is moving on, according to multiple sources of mine. It’s hard to make the case that Sievert, who was responsible for the worldwide introduction of Windows Vista, isn’t being pushed for the less-than-enthusiastic public perception of Microsoft’s latest version of Windows. Even though Microsoft has moved 100-million-plus copies of Vista, many consumers and businesses still consider the new release buggy, sluggish and incompatible with existing software and drivers. Microsoft has tried very hard to encourage adoption of Vista and even offered considerable discounts. In the past, the company openly admitted that it needs copyrights infringement to compete against Linux, but look what it’s doing. Although, unlike previous Windows versions, Vista is not available as an activation-free version, a number of more or less effective methods were quickly found to run Vista without activation. However, this is soon to end. According to Microsoft, Service Pack 1 for Windows Vista closes two vulnerabilities which previously enabled operation of Vista without a license. Back in beta days, PCWorld was a little more positive. Windows lives and dies by its service packs. I can’t recall the last initial release of any Windows product that didn’t have at least some problems. Still, given that Vista is essentially a rewrite of XP meant to enhance security (and, of course, media features), I’m not surprised to see Microsoft take this route for the service pack. Remember that last sentence again. “Vista is essentially a rewrite of XP.” XP was released in 2001 (I was actually a teenager at the time). We explained in the past what led to this disaster, so it’s hardly surprising that amid References Roundup: Microsoft’s Financial Situation financial and workforce readjustment Microsoft finds itself worried. 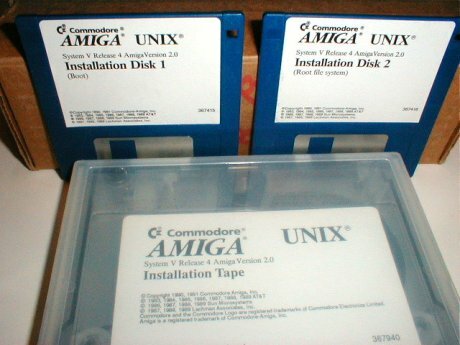 Microsoft Windows: the next UNIX or the next AMIGA? Novell Linux: Another Platform (as in Kernel) for Windows?